President Obama, who once called the idea of “moderate” Syrian rebels a “fantasy,” has maintained the fiction to conceal the fact that many “moderates” are fighting alongside Al Qaeda’s jihadists, an inconvenient truth that is complicating an end to Syria’s civil war, explains Gareth Porter. But what Kerry did not say is that the ceasefire agreement would not apply to operations against Al Qaeda’s Syrian franchise, the Nusra Front, which both the United States and Russia have recognized as a terrorist organization. That fact is crucial to understand why the Obama administration’s reference to “legitimate opposition groups” is a deception intended to mislead public opinion. The Russian airstrikes in question are aimed at cutting off Aleppo city, which is now the primary center of Nusra’s power in Syria, from the Turkish border. To succeed in that aim, Russian, Syrian and Iranian forces are attacking rebel troops deployed in towns all along the routes from Aleppo to the border.Those rebels include units belonging to Nusra, their close ally Ahrar al-Sham, and other armed opposition groups – some of whom have gotten weapons from the CIA in the past. Kerry’s language suggests that those other “legitimate opposition groups” are not part of Nusra’s military structure but are separate from it both organizationally and physically. But in fact, there is no such separation in either of the crucial provinces of Idlib and Aleppo. At least since 2014 the Obama administration has armed a number of Syrian rebel groups even though it knew the groups were coordinating closely with the Nusra Front, which was simultaneously getting arms from Turkey and Qatar. The strategy called for supplying TOW anti-tank missiles to the “Syrian Revolutionaries Front” (SRF) as the core of a client Syrian army that would be independent of the Nusra Front. However, when a combined force of Nusra and non-jihadist brigades including the SRF captured the Syrian army base at Wadi al-Deif in December 2014, the truth began to emerge. The SRF and other groups to which the United States had supplied TOW missiles had fought under Nusra’s command to capture the base. And as one of the SRF fighters who participated in the operation, Abu Kumayt, recalled to The New York Times, after the victory only Nusra and its very close ally Ahrar al-Sham were allowed to enter the base. Nusra had allowed the groups supported by the United States to maintain the appearance of independence from Nusra, according to Abu Kumyt, in order to induce the United States to continue the supply of U.S. weapons. In other words, Nusra was playing Washington, exploiting the Obama administration’s desire to have its own Syrian Army as an instrument for influencing the course of the war. The administration was evidently a willing dupe. Reflecting the views of some well-placed administration officials, he added, “I think the days of us looking the other way are finished.” But instead of breaking with the deception that the CIA’s hand-picked clients were independent of Nusra, the Obama administration continued to cling to it. Nusra and its allies were poised to strike the biggest blow against the Assad regime up to the time – the capture of Idlib province. Although some U.S.-supported groups participated in the campaign in March and April 2015, the “operations room” planning the campaign was run by Al Qaeda and its close ally Ahrar al Sham. And before the campaign was launched, Nusra had forced another U.S.-supported group, Harakat Hazm, to disband and took all of its TOW anti-tank missiles. Furthermore, Saudi Arabia and Qatar were financing the “Army of Conquest,” commanded by Nusra, and were lobbying the administration to support it. U.S. strategy on Syria was then shifting toward a tacit reliance on the jihadists to achieve the U.S. objective of putting sufficient pressure on the Assad regime to force some concessions on Damascus. But the idea that an independent “moderate” armed opposition still existed – and that the United States was basing its policy on those “moderates” – was necessary to provide a political fig leaf for the covert and indirect U.S. reliance on Al Qaeda’s Syrian franchise’s military success. When the fall of Idlib led to the Russian intervention last September, the U.S. immediately resorted to its propaganda line about Russian targeting of the “moderate” armed opposition. 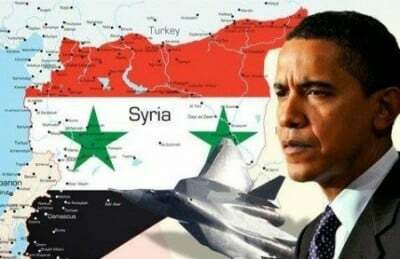 It had become a necessary shield for the United States to continue playing a political-diplomatic game in Syria. As the current Russian-Syrian-Iranian offensive between Aleppo and the Turkish border unfolds, the Obama administration’s stance has been contradicted by fresh evidence of the subordination of non-jihadist forces to the Nusra Front. In late January, Nusra consolidated its role as the primary opposition military force in the eastern part of Aleppo City by sending a huge convoy of 200 vehicles loaded with fighters, according to the Syrian Observatory for Human Rights in London. BBC reported that “thousands of troops” had just arrived in Aleppo for the coming battle. Ahrar al-Sham confirmed on Feb. 2 that its ally, the Nusra Front, had deployed a large convoy of “reinforcements” to Aleppo. The pro-Assad Beirut daily As-Safir reported that the convoys also included artillery, tanks and armored vehicles, and that Nusra had taken over a number of buildings to serve as its headquarters and offices. An assessment published on Saturday by the Institute for the Study of War, which has long advocated more U.S. military assistance to Syrian anti-Assad groups, provides further insights into the Nusra Front’s system of control over U.S.-supported groups. One way the jihadist organization maintains that control, according to the study, is Ahrar al Sham’s control of the Bab al Hawa border crossing with Turkey, which gives Nusra and Ahrar power over the distribution of supplies from Turkey into Aleppo City and surrounding areas. ISW points out that another instrument of control is the use of “military operations rooms” in which Nusra and Ahrar al Sham play the dominant role while allocating resources and military roles to lesser military units. Although the Nusra Front is not listed as part of the “Army of Aleppo” formally announced to combat the Russian offensive, it is hardly credible that it does not hold the primary positions in the operations room for the Aleppo campaign, given the large infusion of Nusra troops into the theater from Idlib and its history in other such operations rooms in the Idlib and Aleppo regions. Yet another facet of Nusra’s power in Aleppo is its control over the main water and power plants in the opposition-controlled districts of the city. But the ultimate source of Nusra’s power over U.S.-supported groups is the threat to attack them as agents of the United States and take over their assets. Al Qaeda’s franchise “successfully destroyed two U.S.-backed groups in Northern Syria in 2014 and early 2015,” ISW recalls, and initiated a campaign last October against one of the remaining U.S.-supported groups, Nour al Din al Zenki. The official U.S. posture on the current offensive in the Aleppo theater and the proposed ceasefire obscures the fact that a successful Russian-Syrian operation would make it impossible for the external states, such as Turkey and Saudi Arabia, to resupply the Nusra Front and Ahrar al Sham and thus end the military threat to the Syrian government as well as the possibility of Al Qaeda’s seizure of power in Damascus. Russian-Syrian success offers the most realistic prospect for an end to the bloodletting in Syria and would also reduce the likelihood of an eventual Al Qaeda seizure of power in Syria. The Obama administration certainly understands that fact and has already privately adjusted its diplomatic strategy to take into account the likelihood that the Nusra Front will now be substantially weakened. But it cannot acknowledge any of that publicly because such a recognition would infuriate many hardliners in Washington who still demand “regime change” in Damascus whatever the risks. President Obama is under pressure from these domestic critics as well as from Turkey, Saudi Arabia and other GCC allies to oppose any gains by the Russians and the Assad regime as a loss for the United States. And Obama administration must continue to hide the reality that it was complicit in a strategy of arming Nusra – in part through the mechanism of arming Washington’s “moderate” clients – to achieve leverage on the Syrian regime. Thus the game of diplomacy and deceptions continues.